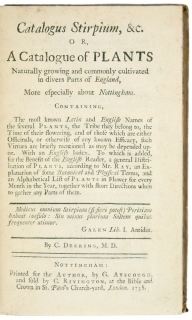 Or, a Catalogue of Plants naturally growing and commonly cultivated in divers parts of England, more especially about Nottingham. 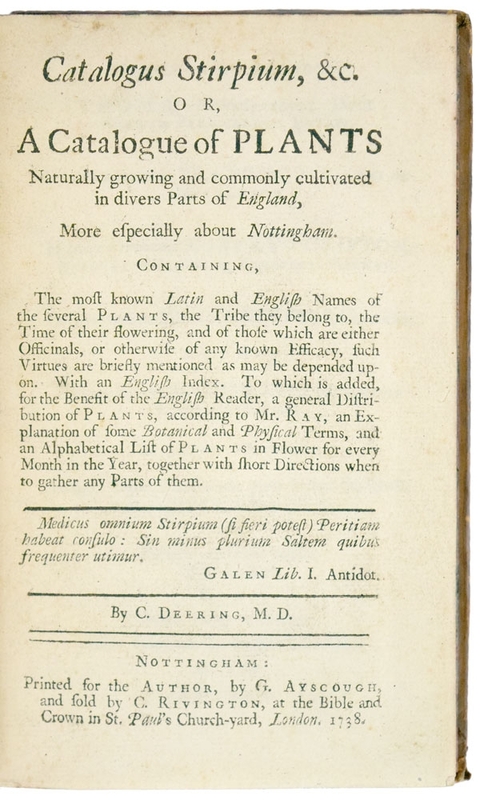 Containing, The most known Latin and English Names of the several Plants, the Tribe they belong to, the Time of their flowering, and of those which are either Officinals, or otherwise of any known Efficacy, such Virtues are briefly mentioned as may be depended upon. With an English Index. To which is added, to the Benefit of the English Reader, a general Distribution of Plants, according to Mr. Ray, an Explanation of some Botanical and Physical Terms, and on Alphabetical List of Plants in Flower for every Month in the Year, together with short Directions when to gather any Parts of them.